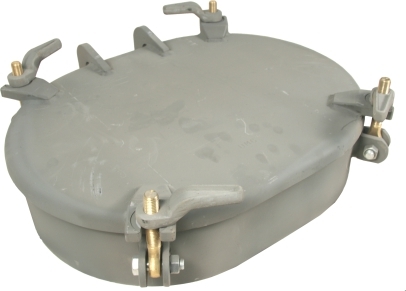 All of our raised watertight hatches meet ABS (American Bureau of Shipping) requirements for design and materials. Raised watertight hatches are strong and secure enclosures designed to be easily accessed when needed. They are universally used on all types of commercial vessels from tank barges, hopper barges, box barges and push-boats to OSVs and larger commercial vessels. Their simple design and quality steel construction help them meet long range trouble-free service requirements in the harshest environments. Various standard coaming heights available (Custom coaming heights avilable upon request). Other gasket material available upon request. – Steel, Stainless Steel, & Bronze Dog Handles (available with or without grease fittings). – Bronze & Stainless Steel Tumble Bolts. – Lug Bolts and nuts made from dissimilar metals to prevent galling and corrosion. Flame screens available upon request (sold separately). Raised watertight hatches are typically found along the gunnels of a barge as well as on the bow/ stern and on top of cargo compartments or tanks. They are used to access wing tanks, the rake compartment, cargo compartments etc. for venting, filling, and inspecting.